Powers/Abilities: Hexus was a living idea that had turned into a ferocious parasite. It grew by hiring new employees and by devouring its rivals. It adapted quick to the needs of its target world and imitated what people wanted. It hypnotized them with advertising and then turned them into employees. The people would then serve Hexus without knowing what it really was until everything was Hexus and the planet was turned into D2K1 (Digital Koncentration Kamp 1). Mindless workers would then build spaceships to carry Hexus' logo-spores to new worlds. On the original host Hexus would then continue to replicate and consume everything and itself. After having spored its life cycle was completed and Hexus died, leaving behind mass extinction. (Marvel Boy II#3 (fb) - BTS) - In the Sunken Galaxy Hexus infected EarthN. When the 18th Kree Diplomatic Gestalt arrived in the reality they had to sterilize the entire timeline and only Hexus survived. They imprisoned it in a tank and kept it in their ship's Concept Dungeon. (Marvel Boy II#1 - BTS) - Hexus escaped with one of Dr. Midas' men from the Marvel when they raided it. (Marvel Boy II#3 (fb) - BTS) - Hexus became the corporation Brand Hex and began to enslave humans for its purpose. It soon was one of the fastest growing corporations on Earth. (Marvel Boy II#3) - One day a musician and a computer software specialist went to Brand Hex to get a job. They were both surprised at the multitude of genres Brand Hex was involved with. A secretary then told them that Mr. Greepy would see them now. The two men were shown around by Mr. Greepy, who didn't want to hear the musician's demo tape. When the software specialist asked what the D2K1 ads meant, Mr. Greepy told them that this would be the future name of Earth when Hexus was finished with it. The two surprised men were brought away by two guards to be turned into loyal servants of Hexus. One month later the Plex Intelligence told Noh-Varr that Hexus had escaped from the Marvel's Concept Dungeon and that Noh-Varr had the responsibility to stop it. Hexus had already become a successful and powerful conglomerate. Noh-Varr entered the former Hexus HQ only to find it empty because Hexus had already found a newer, bigger place. Earth's people suspected nothing. 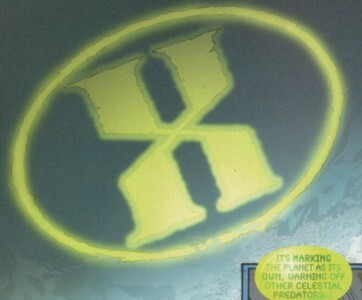 Hexus then started the D2K1 event by marking Earth with a bioluminescent logo that could be seen from space to warn off other celestial predators. Noh-Varr started his attack on the new HQ and managed to get through police and security to Hexus' CEO and prime servant Mr. Greepy (the musician seen in the flashback earlier). Noh-Varr was ready to shoot him, but Mr. Greepy attacked him first with an energy beam from his eyes fueled by his own body heat until he burnt himself out and died. A new female CEO entered the office seconds later to continue the attack and four more followed. Noh-Varr jumped out the window because he was finished linking the Plex Intelligence with Hexus' computer network. At this point Hexus was already in negotiations with NASA. 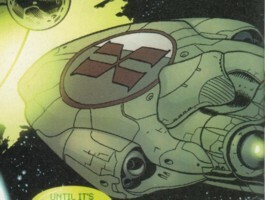 Outside the building Noh-Varr jumped onto a Hexus helicopter. He contacted the newest Hexus CEO Mr. Greepy to inform him that he had found a way to defeat Hexus. He explained that he had just kept Hexus busy while Plex had hacked the Hexus database to send all its secrets to rival corporations. Hanging upside down from the helicopter Noh-Varr used a cosmic bullet to destroy the Brand Hex HQ and Hexus' control over its employees. With no more slaves and all its secrets handed to its enemies the living corporation was defeated. In fast manner the living corporation was taken apart by other corporations. It tried to survive by releasing as many employees as possible, but each minute another disaster hurt the corporation even more. Former employees that survived the HQ's explosion told the media that their minds had been controlled by the corporation. Soon the Brand Hex shares fell, teenagers had their Brand Hex tattoos removed and nobody wanted anything from Brand Hex anymore. The next day nothing was left of the living corporation as it went bankrupt. Comments: Created by Grant Morrison and J.G. Jones. I'm not sure if female CEO's of Brand Hex were called Mr. Greepy too or if they were called Ms. or Mrs. Greepy. To be honest, I don't think Hexus cared too much about its slaves to be interested in such minor details. I don't think Hexus was able to travel to other dimensions. The Sunken Galaxy was the place of Hexus' origin and because only Hexus survived in the reality I'm sure that EarthN was part of the Sunken Galaxy. I never saw a Earth designated with a letter, but I can't argue with it. If this is the way Kree number their alternate realities, it is the way it is. I'm not sure, but I think the Core Continuum Designation of this Earth was something like Earth-10002. Hexus rocked! The whole Marvel Boy series rocked! If you don't have it yet -- BUY IT! Mr. Greepy was the CEO of Brand Hex, director of their global operations, the voice of Hexus and therefore the Prime Servant of the Living Corporation. As soon as one Mr. Greepy had died it was replaced by a new one. Hexus used the body heat of Mr. Greepy to create energy beams that where released through the eyes. Using this attack was lethal within seconds to the attacker him/herself. (Marvel Boy II#3) - Mr. Greepy led two men around in the current HQ of Brand Hex. At the end of the tour Greepy had the two men brought away by guards to turn them into slaves of Hexus. One month later Noh-Varr attacked the new HQ of Brand Hex and one of the two men that had been capture a month ago was the current CEO. Hexus used the body heat of the current Mr. Greepy to attack Noh-Varr with energy rays from Greepy's eyes until Greepy burnt himself out and died. Succeeded by a female Mr. Greepy, who explained to Noh-Varr, that Hexus could promote and waste as many employees as it wanted, the attack on Noh-Varr was continued. She used the same techniques and died by burning herself out. Four more followed her in the position as Mr. Greepy. They attacked Noh-Varr with energy rays as well, but he jumped out the window. They soon burnt out and died without doing any damage. The next Mr. Greepy was contacted by Noh-Varr, who informed him how he was defeating Hexus by making its enemies stronger. This Mr. Greepy could only watch as the secrets of the living corporation were given to their rivals. He told Noh-Varr that he could still dismiss him and that the hunger of the living corporation couldn't be opposed. Noh-Varr used a cosmic bullet to destroy Mr. Greepy and the upper floors of the Hexus HQ to proof him wrong.